This week I’m featuring Moriarty by Anthony Horowitz, one of my TBRs that I’ll be reading next. Does anyone really believe what happened at the Reichenbach Falls? A great many accounts have been written but it seems to me that all of them have left something to be desired – which is to say, the truth. Anthony Horowitz is one of my favourite authors. This is his second Sherlock Holmes novel and I’m hoping, no I’m expecting it to be as good as his first, The House of Silk. Years ago I read Arthur Conan Doyle’s short story The Final Problem, in which he meant to end Sherlock Holmes’ life as he wanted to write more literary works, but needless to say really, I have forgotten most of the details. Last year when I read The Word is Murder I thought it was a very clever and different type of murder mystery. It features Daniel Hawthorne, an ex-policeman, now a private investigator, who the police call in to help when they have a case they call a ‘sticker’. What I found particularly interesting was the way that Anthony Horowitz inserted himself into the fiction, recruited by Hawthorne to write a book about him and the cases he investigates. 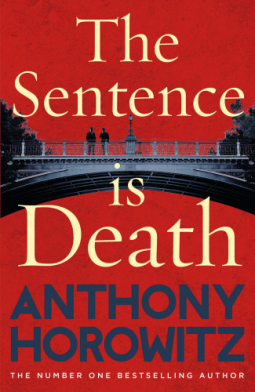 In The Sentence is Death, Anthony appears again as a character, reluctantly, as he had agreed to a three-book contract with Hawthorne. At the start of the book Anthony, who wrote the script for the TV series of Foyles War, is on the set as the opening scenes in the seventh series were being shot. The rehearsal was disastrous, but it came to an abrupt end when Hawthorne interrupted the scenes by driving straight into the middle of the set to tell Anthony there had been another murder and that the police had asked for his help. Divorce lawyer Richard Pryce was found dead in his home, having been hit on the head by a wine bottle, a 1982 Chateau Lafite worth £3,000, and then stabbed to death with the broken bottle. There are several clues – there’s the number 182 written in green paint on the wall, the incredibly expensive bottle of wine when Pryce was a teetotaller, a public threat from a well known feminist writer, an unknown visitor the evening he was killed and plenty of other enemies as suspects. 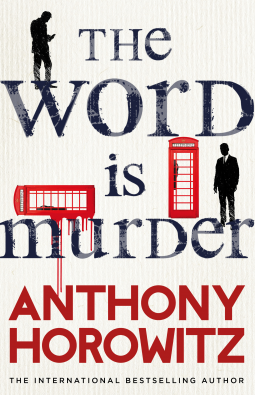 There’s no doubt that Daniel is a brilliant detective, but Anthony finds him trying as he’s uncommunicative, keeping Anthony in the dark most of the time, he swears and he calls him ‘Tony’. I found it all most entertaining and perplexing, completely foxed by all the red herrings and twists and turns in the plot. But, mainly because I’d read the first book, I loved the interaction between Anthony and Daniel and had no difficulty with the mix of fact and fiction, enjoying the details about Anthony’s life as a scriptwriter as much as the mystery about the murder. I don’t think, however that you need to read The Word is Murder first because as a murder mystery The Sentence is Death works well as a standalone. But to see how their relationship began and develops it would help to read the books in order. I loved this book as much or maybe even more than the first one and am delighted that I received a copy of this book from the publisher, via NetGalley, for review. The Word is Murder is a very clever and different type of murder mystery. I don’t think I’ve read anything like it before, one in which the author himself plays a major role. Diana Cowper was killed later the same day after making the arrangements for her funeral. She was strangled in her own home. The police at first thought she’d been killed during a burglary, but there were no fingerprints or indeed any other clues to help find her killer. The novel goes into a different realm with the introduction of ex-policeman, Daniel Hawthorne, who had been an adviser for Horowitz’s Foyle’s War series. The police call on Hawthorne as a consultant on out-of-the ordinary cases and he is working on the Diana Cowper murder. He proposes that Horowitz writes a book about him and his investigations into the case. However, they disagree about what Horowitz should write, which highlights the difference between writing crime fiction and true life crime books – and Horowitz gets dragged into the investigations. At first I was slightly confused – were the details about Horowitz fact or fiction (a lot of it is true), was Hawthorne a real person or a fictional character, what was fact and what was fiction? It really is one of the most complicated and bemusing books I’ve read, full of realistic characters acting in a mystery full of red herrings and multiple twists and turns. I was soon totally immersed in this fascinating novel. I loved Magpie Murders, and I think Horowitz The Word is Murder is equally as amazing and maybe even better! I was totally unable to solve the mystery, the clues were all there, but I was so involved in sorting out what was real and what wasn’t and enjoying the puzzle that I completely missed them. I am so delighted that I received a copy of this book from the publisher, via NetGalley, for review. 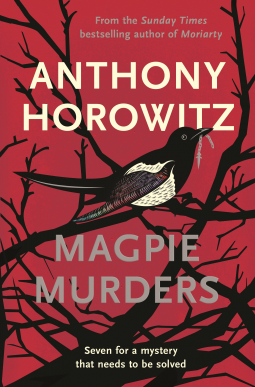 I previously enjoyed The House of Silk by Anthony Horowitz, so when I saw Magpie Murders on NetGalley I was keen to read it and delighted when I received an uncorrected proof. I think it is an outstanding book by a master story-teller, with a wonderfully intricate plot. It’s a prime example of a puzzle-type of crime fiction combining elements of the vintage-style golden age crime novel with word-play and cryptic clues and allusions to Agatha Christie and Arthur Conan Doyle. It’s also a novel within a novel, with mystery piled upon mystery. I loved it. The outer story and the contemporary mystery is that of Alan Conway, the author of the Atticus Pund Mysteries. His editor, Susan Ryeland is reading a manuscript of his latest novel Magpie Murders, expecting to enjoy it as much as his earlier books, even though she really couldn’t stand Conway himself. What she wasn’t prepared for is that this book would change her life. The inner story, that told in Conway’s novel is a whodunnit, a murder mystery full of twists and turns with plenty of red herrings. I was enjoying it as much as Susan as she read of the death of Mary Blakiston in the little village of Saxby-on-Avon in 1955. Mary was an unpleasant character. She had been found dead at the bottom of the stairs at Pye Hall where she was the cleaner for the owner, Sir Magnus Pye. It appeared that she had tripped and fallen down the stairs.Then Magnus is also found dead, but this was obviously murder as he had been beheaded. So back to the outer story. When Susan came to the end of the manuscript she found it wasn’t finished – there was no denouement. And she couldn’t contact Conway to get the final chapters of the book and then she discovered that he was dead. So, she sets out to find the missing chapters and in so doing discovers even more mysteries – was Conway’s death an accident, suicide or murder? Like Mary Blakiston in his novel, he was not a popular man, and there are a number of other parallels between his novel and his real life. Magpie Murders is a really satisfying read, with believable characters, set in beautifully described locations, tantalisingly mysterious and so, so readable. I also particularly liked the use of the rhyme of ‘One for Sorrow’ in the chapter headings of Conway’s novel in the same way that Agatha Christie used ryhmes in some of her books. It’s quite long, but the pages sped by as I was drawn into both stories and keen to find the answers to all the questions all the mysteries it had posed. Many thanks to NetGalley and the publishers Orion Books for an ARC. *I enjoyed reading Anthony Horowitz’s book, The House of Silk. It’s pacy, full of atmosphere and mystery, and above all it captures the essence of Sherlock Holmes and Dr Watson. Horowitz’s plot is cunning, full of twists and turns, with allusions to Conan Doyle’s stories. It is November 1890 and London is gripped by a merciless winter. Sherlock Holmes and Dr Watson are enjoying tea by the fire when an agitated gentleman arrives unannounced at 221b Baker Street. He begs Holmes for help, telling the unnerving story of a scar-faced man with piercing eyes who has stalked him in recent weeks. Intrigued, Holmes and Watson find themselves swiftly drawn into a series of puzzling and sinister events, stretching from the gas-lit streets of London to the teeming criminal underworld of Boston and the mysterious ‘House of Silk’ . . . The book is narrated by Watson as he looks back on two of the most puzzling and sinister cases he and Homes had to solve November 1890 – that of The Man in the Flat Cap and The House of Silk. The first involves an art dealer, Mr Carstairs who is being threatened by a member of the American Flat Cap Gang, whereas the second concerns the murder of Ross, a new member of the Baker Street Irregulars, the scruffy, ragged gang of street urchins Sherlock Holmes uses to help him track down criminals. For a while I couldn’t see how these cases connected, or indeed if they did, as Horowitz effortlessly spun the wool over my eyes . I haven’t read anything by Anthony Horowitz before, although when I read that he is a TV screenwriter, including Midsomer Murders, Foyles War and Poirot to his name I realised that I’ve certainly enjoyed his work before. He’s also written bestselling children’s books, including the Alex Rider series. I’m not often keen on pastiches, prequels or sequels written by a different author from the original but this one is the exception. The House of Silk is vastly entertaining, a page-turner, full of detail and great characterisation, with Holmes at the peak of his powers, even though it nearly costs him his life. I do hope there will be a second book. *Edited after first publishing – see comments*.